150 years after the start of the American Civil War, HISTORY presents The Civil War Today, an award-winning app created exclusively for the iPad. For less than one penny per day you can experience the war as it unfolded, one day at a time, with daily updates that let you live the events in “real-time” over the course of four years. ***Member of the iTunes App Store Essentials Hall of Fame*** ***iTunes App of the Week selection*** The Civil War Today leverages the iPad multi-touch interface to enable app users to feel and explore thousands of original documents, photos, maps, diary entries, quotes, and newspaper broadsheets like never before. 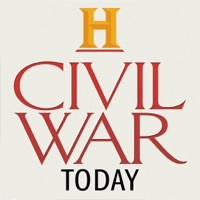 The Civil War Today includes: • Daily Civil War updates from April 12, 2011 through April 26, 2015. The app content updates ONE DAY AT A TIME, precisely mirroring the events of 150 years ago • “In the Headlines” featuring newspapers from every day of the war. • Running tallies of the North and South casualty counts. • “A Day in the Life” with personal letters and diary entries from 15 individuals including Abraham Lincoln, Horatio Nelson Taft, and Mary Boykin Miller Chesnut. • Photo of the day and photo galleries. • Quote of the day. • Articles and video on featured topics. • Authentic period maps from key battlegrounds. • Daily North-South quiz. • Detailed background scenes that put you in the time and place of the Civil War. (Northern city, Southern plantation, Western frontier town, military camp). • Twitter integration to send a telegram via morse code. • Airplay integration for viewing of app video via Apple TV. • Advanced multi-finger gesture functionality and custom toolbar for deep navigation. Witness the Civil War play out 150 years later, one day at a time, in this first-of-its-kind app. This app no longer loads. All I receive is a spinning gear and the text “loading.” My WiFi signal is strong and I have no problems with other apps. HELP! Coming from a network that has made its recent fortunes on the backs of reality television, I wasn't exactly expecting much depth from The Civil War Today. While there are some areas that need polish, the content this app provides is breathtaking in scope. For every day of the civil war (nearly 1500 days) this app provides you with an article describing the events of that particular day from the perspective of citizens of the times. You also get letters and diary entries recorded for each day. Every other day or so brings a secondary article that gives additional context. There are also plenty of photos and relevant maps for each day, although these are often very slow to load. The net result is an app that does a great job giving you a feel of how the Civil War unfolded from the perspective of those that lived through it. Broken. Won't show data past Lee's surrender. The content is amazing and ever-changing. My only complaint is how the app was programmed to draw maps and photos and to redraw them when zoomed in. When zooming in on the very high resolution maps, it feels like the app is trying to redraw the entire map, even the parts that are outside of the viewable area, which takes forever. It often then crashes mid-redraw. Enjoyed this greatly, despite the few quiz errors and the occasional problems, which seemed to peak on April 6. Very unfortunate they quit with so much more to relate, a pity and it left a very negative impression. Haven't missed a day in 2936 days of content. Your efforts are much appreciated. While this app. It would be very interesting to see a modern aesthetic version that presented the information in a present day context. Fantastic update to an already fantastic app! Really liking the new update and new user interface to find and browse dates of significance. Very easy to use and a big improvement! Looks great on my iPadAir Retina! Even easier to navigate, and no more crashing! I like being able to browse through the years or find a specific day in history easily. Great app with tons of information. Have the ability to go instantly to each day. There are photos, illustrations, diary entries, summaries, etc. Tremendous value for your money.